Med Sled’s new line of evacuation kits are designed to provide basic and essential tools for specific roles identified during emergencies, including unit captain, staff, stairwell and patient. The kits ensure safe and timely evacuations and they are customizable, which allows for users to incorporate the right tools at the right time. The kits come in rolling duffle bags, hands-free fanny packs and drawstring bags that are easily deployed and maintained. Thales Communications Inc. introduces the Liberty™, a multi-band, software-defined Land Mobile Radio (LMR) designed for government agencies and first responders to be able to communicate across all of the public safety bands: 136-174 MHz, 380-520 MHz, 700 MHz, and 800 MHz. The radio's Mil-Spec metal housing is submersible to two meters. H.L. 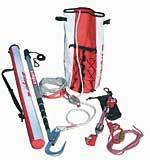 Bouton Co. Inc. unveils its new line of Bouton Emergency Equipment. 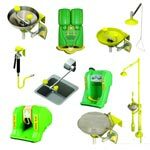 The line includes shower and wash units designed to meet any emergency situation, plus eye and face wash units, combination stations, drench hoses, and more. All units meet ANSI Z358.1. MCR Safety's new 5933 Navigator two-piece suit is constructed of .30 mm breathable polyester/polyurethane material that meets the ASTM D-6413 standard for flame resistance. 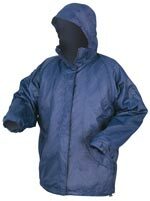 The jacket features double-stitched and taped seams, a zip-out fleece liner, a tuck-away hood, and a zipper front closure with Velcro storm flap. Available in navy blue and in sizes M-X4. Pelican™ Products Inc. introduces the rechargeable 8060 LED duty/tactical flashlight, featuring a Metal Hydride (NiMH) rechargeable battery that offers four hours of peak (6-hours total) burn time. Also it's efficient LED technology allows the light to blast 190 lumens of clean, bright light. Qorpak, a division of All-Pak Inc., announces its launch of the Sunlite GX1 Class 1, Division 1, rechargeable lantern. The device has been engineered to provide 12 hours of continuous run time for professionals working in hazardous applications, including utility companies, laboratories, chemical and industrial facilities, and more. What is your company's preparedness initiative? Many small business will not reopen after a major natural disaster. 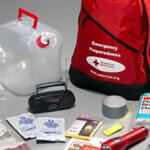 Get tips and resources on how to develop your own Emergency Plan. Find out how to obtain your Preparedness Guide and Business Continuity Planning CD-ROM to help in developing your plan. Watch this informative program including an interview with Wendy Leedy of American Red Cross and Jerry Laws, Editor of OH&S. EmergencyPacks LLC's new portable Model 615 oxygen delivery system uses chemical technology to generate non-pressurized oxygen only when needed, minimizing the chance of combustion. FDA approved, the system requires no prescription and features a single-step activation process that instantly creates 15 minutes of medically pure oxygen. Created through collaboration between Venice Consulting Group and S&P Technologies Inc., iamresponding.com is designed to reduce response times to emergencies and mass disaster situations. Its patent-pending Emergency Responder Reply System™ enables chiefs, stations, team leaders, and dispatchers to see who is responding to a call on the site.